Apocynum cannabinum (dogbane) latex. Photo by L.Wallis. Herbarium, University of Michigan. 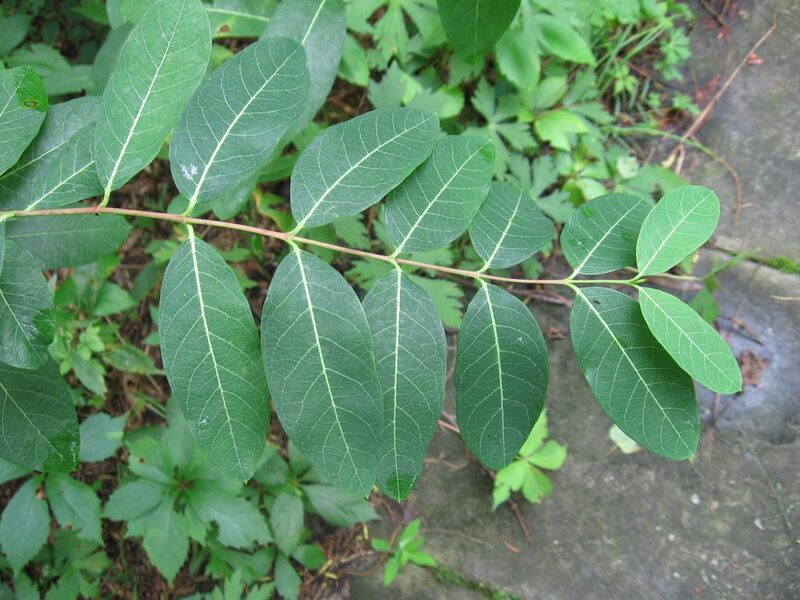 michganflora.net (Accessed 8/2017). 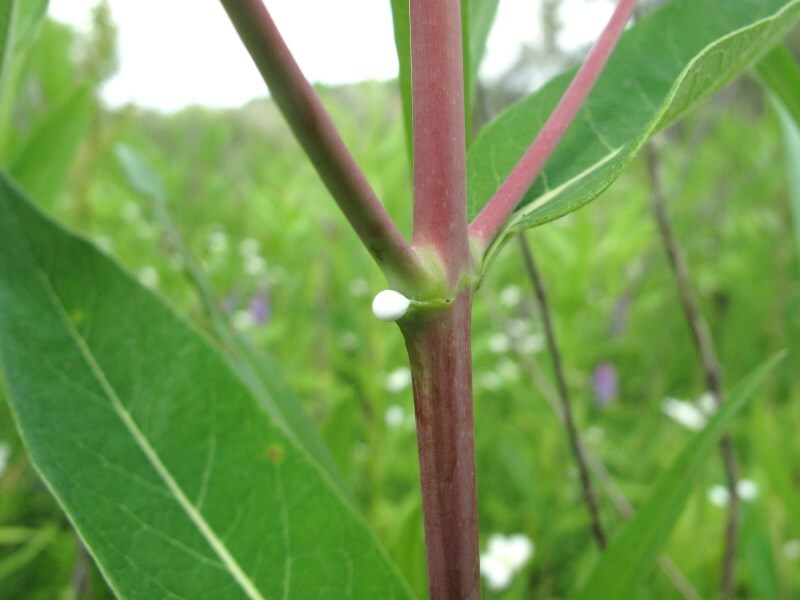 Apocynum cannabinum is a perennial herb, to 1.5 m tall; colonial from rhizomes; stems erect, sap milky, sticky latex; branches curved upward, often red in full sun. Leaves opposite, stalks 0.5-1 cm, blade narrowly oblong, to 11 cm long, tip pointed, base rounded to pointed, often pale-hairy below. 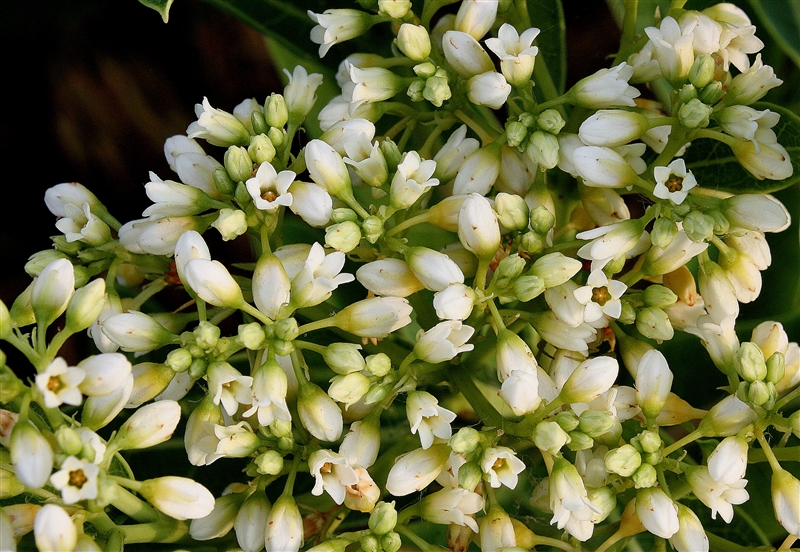 Apocynum cannabinum (dogbane) flowers. R. W. Smith. Herbarium, University of Michigan. michiganflora.net (Accessed 8/2017). Flowers whitish, small, to 0.6 cm wide, radially symmetrical, 5-parted, tubular, petal tube with short lobes; inflorescence of terminal clusters, May-Sept.
Fruit dry, hollow, a pair of linear capsules, to 15 cm long, 0.4 cm wide, splitting to release silky-plumed seeds. 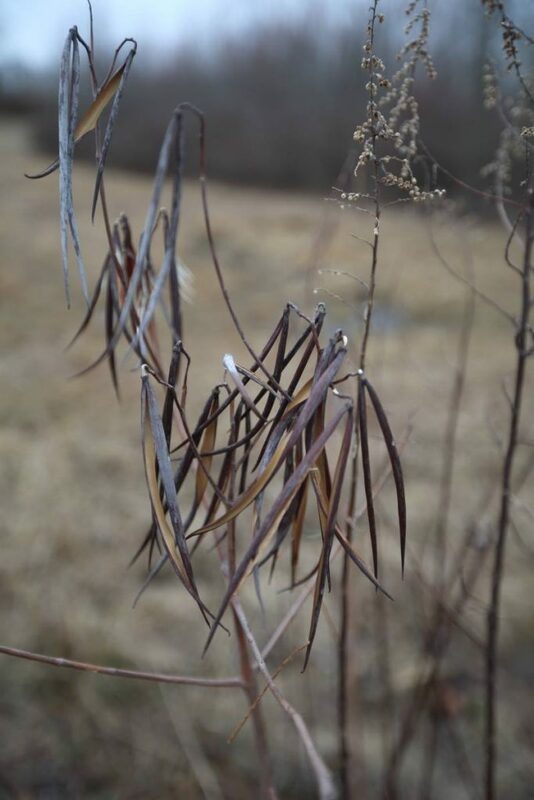 Stems and pod remnants persistent, dark brown in winter. Habitat: Open areas, fill, edges, roadsides, vacant lots, meadows; tolerates nutrient poor soil, pH 4.5-7 (USDA, NRCS 2006). Chrysochus auratus (dogbane beetle) (6881287554). commons.wikimedia.org (Accessed 8/2017). Notes: Contains various toxins including cardio-active glycosides (a class of bitter, sugar-containing, compounds) and resins (Kingsbury 1964). Forms widely spreading colonies. 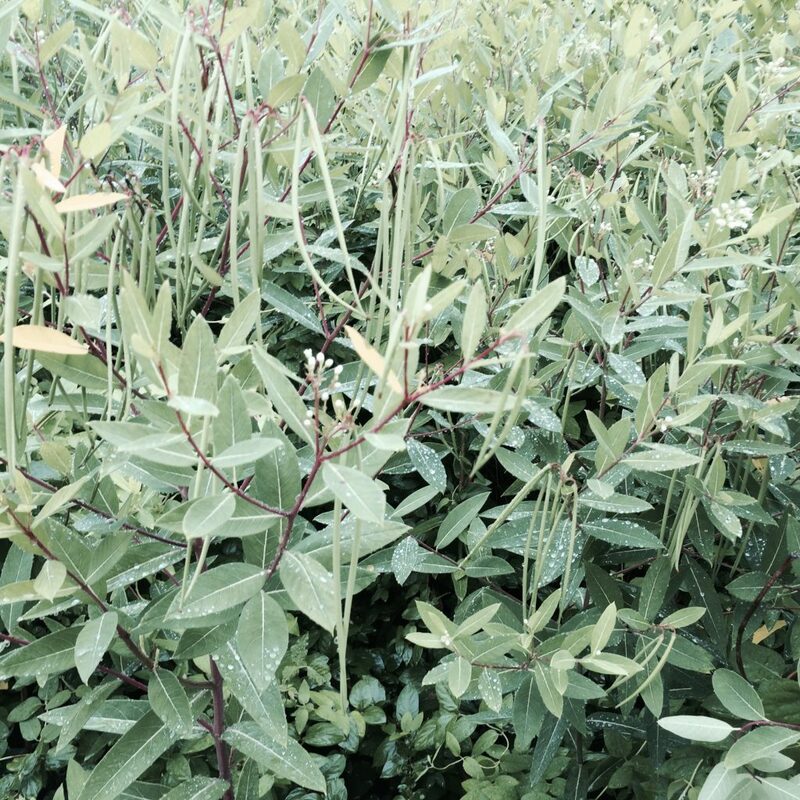 Competes fairly well with mugwort in some habitats (Gargiullo personal observation). 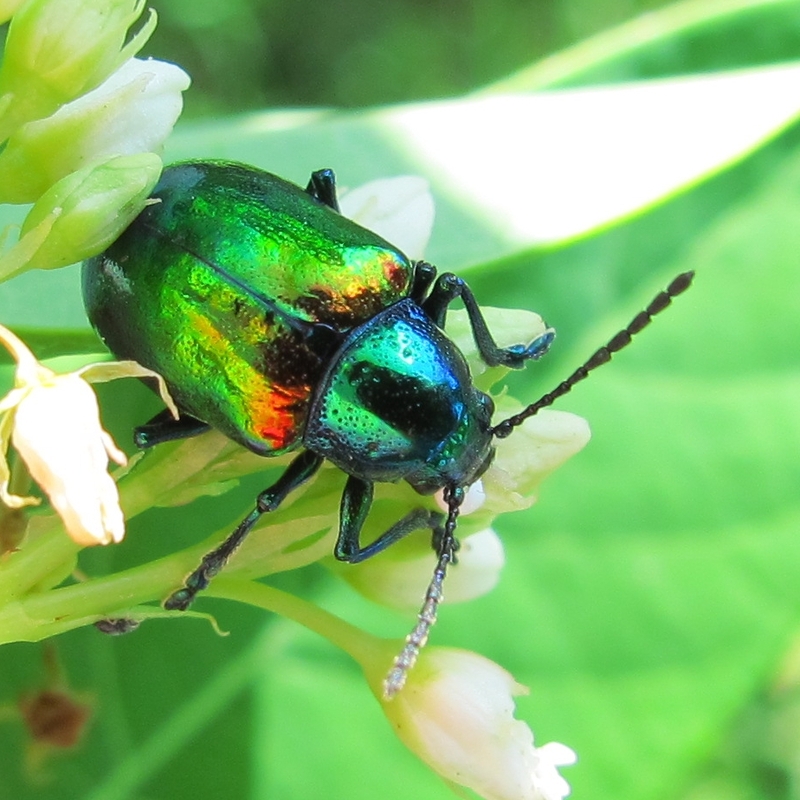 Leaves fed upon by the dogbane beetle, Chrysochus auratus (Coleoptera: Chrysomelidae), which leaves characteristic streaks of latex on the leaf surface after feeding on leaf edges (Williams 1991).